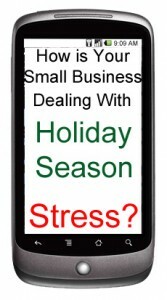 How Should Small Business Owners Deal With Holiday Season Stress? This can be a very stressful time of year for small business owners. Even those who do not celebrate Christmas can get stressed in December and early January. It is almost expected that small retail owners are stressed by the crowds, but they are also stressed by wondering if they will make enough sales to get into the black or make a profit. For non-retail small businesses, the holiday season can be even more stressful. Quite simply, it is because of the holidays that customers and clients have their attention diverted elsewhere. Some clients take extra time away from their offices to get in that Christmas shopping mood or to attend holiday celebrations with employees, friends and family. So having that business meeting or making that business purchase is not at the top of their list of things to do. That does not help small business owners who are working to make those sales, so that they can bring happiness to their families. Also, if you deal with international customers who are in countries that do not celebrate Christmas, you might want take more of your spare holiday time to reach out to them. They may appreciate your efforts more, especially knowing that where you are is a holiday. As an office business centre, clients at Telsec have access to their offices 365 days a year, 24 hours a day. Therefore, it is not unusual to find a number of our office tenants working in their office space on weekends, nights, or even holidays. Sometimes, keeping yourself busy can be good for reducing holiday stress, because you are not allowing yourself to get over-worried about sales numbers. Doing paperwork over a slow holiday season can not only allow you to catch up, but may actually help you prepare for the post-holiday season and give you an advantage over your competition (it can also give you an excuse to avoid visiting that annoying family member). Just remember that if you become stressed out during the busiest time of the year for your customers, never let them see it. You are likely to lose more money in the long run by adding stress to your customers and clients during the holiday season. Who is Looking After Your Office Space When you are on Vacation?